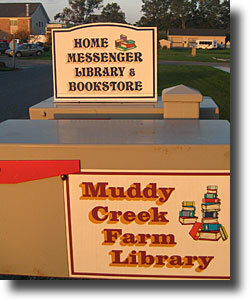 The Muddy Creek Farm Library and Home Messenger Library & Bookstore are both housed in the building pictured, with Home Messenger on the left and Muddy Creek on the right. The building is located on the north side of the Fairmount Campus behind Wheat Ridge Personal Care, but are neither owned nor operated by Fairmount Homes. Both organizations are non-profit. Each is governed by a Boards of Directors from the Weaverland Conference of the Old Order Mennonite Church. The Muddy Creek Farm Library was founded fifty years ago to serve as an organized library and archives among the Old Order and Conservative Mennonite Churches. Old books, letters and documents are preserved by keeping them in a safe, environmentally controlled place. Those who have anything of value to add to this collection are welcome to contact the library. The Muddy Creek Farm Library also features a museum consisting of many artifacts from the past, including those depicting family, farm, and church life as it existed then. 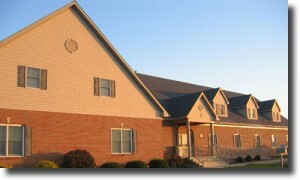 The Home Messenger Library was founded to provide and circulate through a lending library reading material that promotes spiritual growth and truth. It also provides a center for study with non-circulating reference books, including church history, Christian doctrine and genealogies. The Home Messenger Bookstore contains a wide selection of wholesome books, including storybooks, doctrinal books, devotional books, Bibles, cookbooks and gift books, along with a wide array of gift items and supplies. Proceeds from the bookstore are used to help with library upkeep and expansion.